OTTAWA – The Honourable Rob Nicholson, P.C., Q.C, M.P. for Niagara Falls and Minister of National Defence, announced today that Canada will join the US-Ukraine Joint Commission on Defence Reform and Bilateral Cooperation in order to better coordinate Canada’s ongoing provision of assistance to the Ukrainian Armed Forces. The US-Ukraine Joint Commission is the most effective and efficient venue for Canada to ensure the donations and training opportunities provided to Ukraine are appropriate, coordinated and synchronized with Canada’s ally the United States. Canada and Ukraine are committed to continue working together to strengthen the capacity of the Ukrainian Government and its security forces to defend Ukraine’s territorial integrity and its people. At the invitation of the Joint Commission, Canada will lead the Military Police Sub-committee and will coordinate the Joint Commission’s training assistance efforts to Ukraine’s military police. The Joint Commission was formed in July 2014. Canada was an observer at the Joint Commission’s inaugural meeting in October 2014, and later requested and received an invitation for membership on the Joint Commission. The principal role of the Military Police Subcommittee is to coordinate the activities of participating nations to train and develop military police in Ukraine. More details on this subcommittee will become available as Canada undertakes this leadership role. In addition to leading the sub-committee, the Canadian Armed Forces is planning further initiatives to provide training assistance to the Ukrainian Armed Forces on matters related to military policing. Canada has made extensive donations to the Ukrainian military since August, 2014, both through direct donation and support by the Department of National Defence, as well as through the donations and funding support provided by Foreign Affairs, Trade and Development Canada. This includes the donation and delivery of a range of targeted protection, medical and non-lethal military gear. In addition, Prime Minister Stephen Harper recently announced a second low-interest loan of $200 million for Ukraine to help the newly-elected government restore macroeconomic stability, promote sustainable growth, and support programming consistent with Canadian development priorities. On January 26, 2015 the Ukrainian community across Canada held rallies in several major cities, for the immediate release of former Ukrainian Air Force pilot and Member of Parliament of Ukraine Nadiya Savchenko. January 9, 2015 – Kyiv – To mark the arrival of Canadian non-lethal aid to the Ukrainian military via transport plane, the Ukrainian Canadian Congress collaborated with #BABYLON’13 to produce a film highlighting the cooperation between the Ukrainian Canadian community and the Government of Canada to ensure that these desperately-needed military grade winter uniforms, boots and other assistance reached Ukrainian soldiers on the front lines.The UCC requested that Canadian volunteers participate in this mission and they served under the stewardship of Canada’s Ambassador to Ukraine, His Excellency Roman Waschuk. Ms. Lenna Koszarny, Chair of the UCC Ukraine Advisory Council led the Canadian volunteers, long-term, active members of the Ukrainian business community. The UCC thanks and recognizes Roman Sawycky and Bryan Disher for their contribution. The Canadians worked in tandem with Ukrainian volunteers led by Bohdan Kovalev, a member of the Volunteer Council appointed by Ukrainian President Poroshenko and overseen by Yuriy Biryukov and David Arakhamia, who are assisting the Ukrainian government to reform the Ministry of Defence. 9-го січня, 2015 р. – Київ – З нагоди доставки літаком вантажу канадської не-летальної військової допомоги збройним силам України, Конґрес Українців Канади (Конґрес) разом з #BABYLON’13, зняли фільм який висвітлює співпрацю українсько-канадської громади з урядом Канади у забезпеченню, що необхідно потрібні військові зимові форми, чоботи, та інша допомога дійшла до українських солдатів на фронті. Конґрес просив, щоб канадські волонтери брали участь у місії під керівництвом Посла Канади в Україні, Його Високоповажності, Романа Ващука. Олена Кошарна, Голова Дорадчої Ради Конґресу в Україні провадила канадськими волонтреми – активними членами української бізнес-спільноти. Конґрес дякує та визнає внесок Романа Савицького та Брaяна Дишера. Канадські волонтери співпрацювали з українськими волонтерами під проводом Богдана Ковалева, члена Ради Волонтерів призначена Президентом Порошенком. Юрій Бірюков та Давид Арахамія координують роботу ради, та допомагають уряду України у реформуванні Міністерства Оборони. The Paul Yuzyk Award for Multiculturalism commemorates the late Senator Yuzyk’s pioneering legacy in establishing multiculturalism as one of the fundamental characteristics of Canadian heritage and identity. The award recognizes individuals, groups of individuals and organizations in communities across Canada who have made exceptional contributions to multiculturalism and the integration of newcomers. Award recipients receive a certificate signed by the Minister for Multiculturalism, and are asked to nominate a registered not-for-profit Canadian organization or association to receive a grant of $10,000 in their name. We invite you to find out more about the eligibility requirements for the Paul Yuzyk Award and how to nominate an individual, group of individuals, or organization you think deserves to be recognized for exceptional contributions to multiculturalism and the integration of newcomers. The nomination deadline for the 2015 Award is March 31, 2015. January 13, 2015 – Toronto – The Ukrainian Canadian Community is grateful to the Government of Canada, the Ministry of Multiculturalism, and Minister Jason Kenney, for supporting the “Holodomor National Awareness Tour”. The three year grant, valued at $1.5M, will support the education of tens of thousands of students, community leaders and the public at large on the historical events of the horrific Holodomor Genocide in Ukraine, 1932-33. The “Holodomor National Awareness Tour”, is a joint project between four organizations: the Canada Ukraine Foundation (CUF, the lead on the project), the Ukrainian Canadian Congress (UCC), the Ukrainian Canadian Research and Documentation Centre (UCRDC) and the Holodomor Research and Educational Consortium (HREC). “This project will build bridges among communities to promote intercultural understanding, tolerance, awareness and a deeper respect for the democratic values that we Canadians hold so dear,” said Bob Onyschuk, Q.C., Past Chair of CUF, and Project Lead. The tour takes places on a customized 42′ RV, with a state-of-the-art interactive audio-visual technology centre on board. The RV will be wheelchair accessible and will tour Canada, visiting elementary and secondary schools, universities, government buildings, Ukrainian community and Canadian mainstream events, and festivals and gatherings across the country. The goal of the awareness tour is to educate all Canadians about the artificial famine created by Joseph Stalin in 1932-1933, murdering millions of Ukrainians and Eastern Europeans. “We must never waiver in our commitment to the memory of the millions of victims of Stalin’s campaign of terror and the deliberate attempt to destroy the Ukrainian nation,” said UCC National President Paul Grod. “Projects like this ensure that no one ever forgets, and that crimes like this never happen again”. This project will operate as a teaching module for elementary and high school students, teaching the values of multiculturalism, diversity, and the importance of human rights and freedoms, the rule of law and respect for human dignity. It will also present the concept of crimes against humanity and genocide as seen through the lens of the Holodomor. The concept design for the project was developed by Dimension and Design Inc. (Mr. Denny Dzerowicz, CEO) and by TAG’s CEO Peter Trecapelli, whose firm built the “Tour for Humanity” and “It’s An Honour” mobile tours noted above. Between these two firms, there exists over 85 years of experience in major exhibitions. 13-го січня 2015 р. – Торонто – Українсько-канадська громада висловлює вдячність уряду Канади, Міністерству Багатокультурності, та Міністру Джейсону Кенні за підтримку “Національної тури усвідомлення Голодомору.” Ґрент в сумі $1,5 мільйонів, який розподіляється на три роки, сприятиме навчанню десятки тисяч студентів, громадських діячів, та ширшу громадськість про жахливі події 1932-33 рр – Голодомору-Геноциду в Україні. “Національний тур усвідомлення Голодомору” – спільний проект чотирьох організацій – Канадсько-Української Фундації (КУФ – керівник проекту), Конґресу Українців Канади (Конґрес), Українсько-Канадського Дослідчо-Документаційного Центру (УКДДЦ) та Науково-Освітного Центру Вивчення Голодомору. “Цей проект сприятиме розвитку міжкультурного взаєморозуміння, толерантності, єдності, та глибшої поваги демократичним цінностям, котрі ми, як канадці, вважаємо неодмінними,” заявив Богдан Онищук, бувший голова КУФу, та керівник проекту. Тур відбуватимется на спеціальному автобусі 12,8 м довжини, з найсучаснішою інтерактивною аудіо-візуальною технологією. Автобус буде доступний для інвалідів та буде відвідувати початкові та середні школи, університети, урядові будинки, громадські заходи, та фестивалі по цілій Канаді. Мета туру – підвищення рівня знання всіх канадців про голод, навмисно створений Йосипом Сталіном в 1932-33 рр, який вбив мільйони українців та східно-європейців – Голодомор. Подібні мобільні тури навчання в Канаді включали “Тур для Людства,” організований Центром Симона Візенталя для Вивчення Голокосту, та “Це Честь,” організований Фундацією Rideau Hall, який висвітлює канадських героїв. Цей проект працюватиме як навчальний модуль для студентів початкових та середних шкіл, й вчитиме багатокультурність, різноманітність, та важливість людських прав й свобод, верховенства права, й повагу людської гідності. Проект також представлятиме концепцію злочинів проти людства й геноцидів через призму Голодомору. The Canadian Ethnocultural Council held its Biennial General Meeting of members on December 14, 2014 at the Columbus Centre in Toronto. Founded in 1980, the Canadian Ethnocultural Council (CEC) is a non-profit, non-partisan coalition of national ethnocultural umbrella organizations which, represent a cross-section of ethnocultural groups across Canada.The CEC’s objectives are to ensure the preservation, enhancement and sharing of the cultural heritage of Canadians. This meeting brings together community leaders from all across Canada. Ukrainian Canadian Congress representatives were: Paul Grod President and Member of the CEC Board, Renata Roman VP UCC, and Wasyl Luczkiw , Youth Representative on the CEC Board. The morning session consisted of sharing projects and goals of various communities. Mr. Paul Grod spoke of the situation in Ukraine and how the Ukrainian community in Canada is rising to the challenge and helping where they can. Guest speaker, the Honourable Jason Kenney, Minister Employment and Social Development and Minister for Multiculturalism, addressed the membership and encouraged cultural communities to continue to dialogue and work together. He spoke of the well organized Ukrainian community as an example of excellent coordination and leadership. In closing the newly elected President, Dominic Campione, stressed that multiculturalism is a very fundamental part of the Canadian identity. Mr. Campione vowed “to continue to work with and engage ethnocultural communities to foster harmony and acceptance of our diversity which is the basis of our great country”. Newly elected President, Dominic Campione, a national past president of the National Congress of Italian Canadians, stressed his passionate conviction that multiculturalism is a very fundamental part of the Canadian identity. The first international conference on “Development, standardization and implementation of tactical medicine in Ukraine” was held in Kyiv 19-21 January 2015. The organizer of the event was the Ukrainian World Congress (UWC) humanitarian initiative Patriot Defencethat conducts tactical medicine training in accordance with U.S. and NATO standards. The conference was attended by over 450 participants from around the world, including U.S. army experts and military doctors from Canada and Europe. Parallel to the panel discussions participants were acquainted with practical methods of tactical medicine with an exhibition of foreign and domestic goods. Eight Ukrainian photojournalists and documentary photographers (Alex Furman, Max Levine, Roman Philip, Anastasia Vlasova, Maxim Dondyuk, John Bogdan, Peter Zadorozhnyy and Alexander Ratushnyak) provided photos they had taken while working in the war zone in Eastern Ukraine. The photo exhibit on display during the conference was devoted to the conditions of field medicine and medical support for Ukrainian soldiers. The opening of the conference was attended by Minister of Health of Ukraine Аlexander Kvitashvili, Head of the Security Service of Ukraine (SBU) Valentyn Nalyvaichenko, Chair of the Health Care Committee of the Verkhovna Rada Olha Bohomolets, and representatives of Ukraine’s Ministry of Defense, State Security Administration, Ministry of Internal Affairs, State Border Service and other security agencies. CBC’s The Fifth Estate produced an episode on the dark side of Vladimir Putin. Host Gillian Findlay investigates the his allegations to criminal activity, ties to organized crime and his journey to becoming of the world’s most powerful and sinister leaders. To watch the episode click the link below. Our featured Ukrainian Canadian is Adrian Petriw (AP). 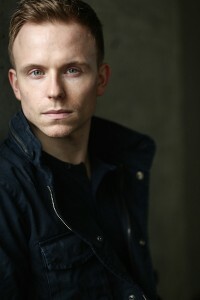 Adrian is an up and coming actor whose work includes: film, television, theatre as well as voice work. He has appeared in a number of popular TV shows such as Continuum and Arrow as well as lending his voice to animated series such as Iron Man: Armored Adventures and Hero:108. Michael Hrycak (MH) from the UCC National Office in Ottawa conducted the following interview with Adrian. MH: Where are you from originally and what was your childhood like growing up? AP:I was born in Toronto, though my family moved to Vancouver BC when I was 3 years old. I’m the youngest of 3 brothers, and we were raised in such a way that Ukrainian culture was a part of our daily lives. For example, in the 8th grade, I won the district public speaking contest by giving an 8 minute lecture on the Holodomor… that I wrote myself! MH: How and when did you get into acting and theatre? What were some of your influences? MH: You have done a variety of work (film, television, theatre and voice work), which is your favourite? What has been your favourite piece of work? AP: Theatre, Film and Voice Over offer such different experiences for the actor, so it’s hard to say one is my favourite over another. There is nothing like the energy of performing for a live audience, and I am simultaneously in love with and terrified by the feeling of stepping out on stage, and knowing that I am exposed, and there is no stopping this freight train from leaving. Film is slower paced, but demands a maddening amount of precision. It’s like surgery, or defusing a bomb, trying to deliver a truthful performance on screen. Voice Over is play-time. I get to play heroes and creatures I would never be considered for on film. That’s not to downplay the difficulty of it… Take all of the nuance of a film performance and channel it into the voice, so it can be heard and felt, as opposed to seen. Take the physical energy and commitment of theatre, but harness it standing on the spot with a mic 6 inches from your face. My dream come true project-wise was playing Iron Man for two seasons on Marvel’s animated series. MH: Have your Ukrainian roots influenced your career? Have you ever thought of incorporating them into your career? AP: I have long dreamed of incorporating my heritage into my craft. Aside from wearing it on my sleeve, which I do literally and figuratively, I want to tell uniquely Ukrainian stories on stage and screen, and bring them to a new audience. Holodomor, the UPA, Maidan, Shevchenko… These are stories that deserve to be a part of the wider cultural lexicon in North America. MH: Are there any projects you are working on now or ideas you have in the future? AP: Unfortunately, I can’t speak publicly about most of my upcoming projects yet, but keep your eyes and ears open for me… I’m always popping up in unexpected places. January 5, 2015 – Toronto – As Canadians across the nation were getting ready to watch the Gold Medal game of the World Junior Hockey Championship (WJHC) between Canada and Russia, members of the Ukrainian community braved the blistering cold outside the Air Canada Centre to protest the Putin regime. Led by UCC President Paul Grod, two dozens Ukrainian Canadians stood outside the arena before the puck dropped with Canadian and Ukrainian flags along with signs that read, “GO CANADA GO” and “PUTIN GET YOUR HANDS OFF UKRAINE”. “It is a rally to show support for Team Canada. We are very proud Canadians. We feel it is very important to make sure Team Canada feels our full support…..We are trying to send a message to the Russian Team and the people in Russia that they are being fed a bunch of lies by their president who controls the media there” said Paul Grod, who was dressed in a Team Canada jersey and a blue and yellow Ukraine scarf. Resident of Toronto and member of the Ukrainian Canadian community Peter Schturyn, said he joined the protest hoping to continue to raise awareness that there is still a war between Ukraine and Russia. “It’s not the warmest of days. But in spite of all the bad weather, we just want to continue to do our part, continue to support the people in Ukraine…We are not at war with the Russian people. Our countrymen are at war with the Russian regime,” Schturyn said, in response to the boos from the Russian fans. Oksana Mallik said she hopes Canadians and the world do not forget Ukraine and its people. “I was sorry for the people who are standing and protesting here. It’s freezing. I’d rather stay at home, but this is no comparison to the suffering of the people in Ukraine,” said the Mississauga woman. After going up 5-1 in the middle of the second period Team Canada watched Russia respond with 3 goals to make it a 5-4 game going into the third period. After a grueling final period, our boys held on to their one goal lead and emerged victorious, winning the gold medal and becoming the champions once more, since 2009.